Hi everyone! I hope you had a great weekend. Mine was busy but nice, today it was the "cleaning day" with out favorite helper who is a super cute lady which brings positivity and laughter to our flat. That said I had to do a lot of work too because even my suitcase was not fully unpacked and everything was everywhere right where I left them before the holidays. I had no time to go over the things because of the job change and today was the day! I am exhausted but happy, threw away lots of stuff and now it looks like home again! One of the Fall Collection I was super excited about is Suqqu's. I am head over heels about the Blend Color Eyeshadow #20 in Kaoribara (reviewed here). Burgundy/Taupe/Gold combination was sure to work on me and it did beautifully. I didn't think though that I would love the Khaki Quad, #21 Yoihagi this much... Today it is about this beauty. To give you a hint, it is especially for those who find khakis to be a bit too warm. Here is an out-of-focus take for you to see how complex each shade is. 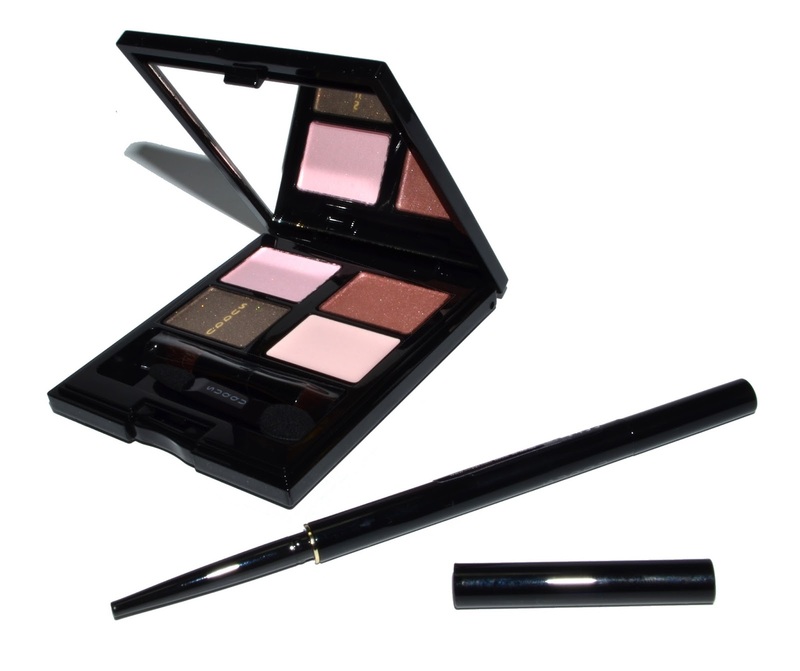 The best thing with Suqqu eyeshadows is that they perform beautifully on mature eyes without emphasizing fine lines. The shimmer is very soft. It delivers the complexity while not making you look like a disco ball. These also layer beautifully so I included a layered swatch of the three powder shades. Isn't that taupe stunning? 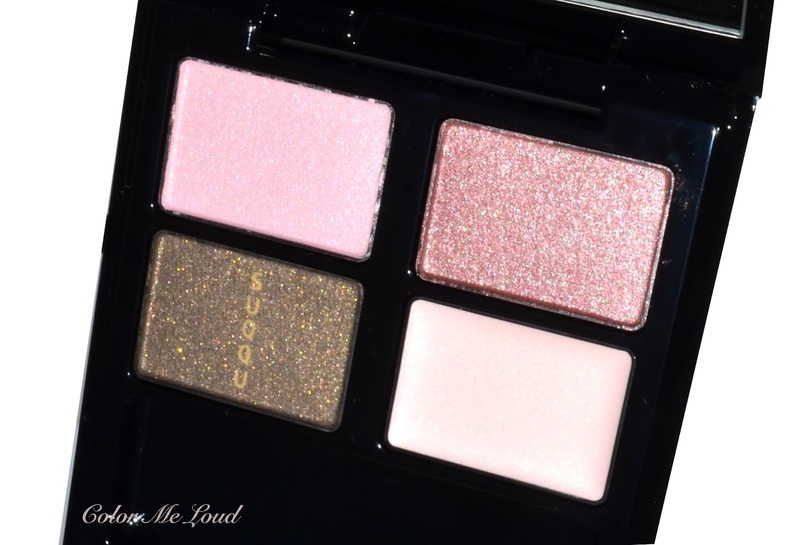 Suqqu Quads often have a base shade. The three of the quads which were released this Fall have a cream base shade which works perfectly to make the other shades come to life while prolonging their longevity. Top left (powder): Very light cool pink with soft Suqqu shimmer. This shade is great to highlight the inner corner and brow bone. You can also use it layered over the other shades to make them lighter. Top right (powder): A stunning mid toned plum. I love it so much that I can just use this one and become happy. It reminded me of the middle shade of Suqqu Summer Trio Ex-02 Yosaizora (reviewed here) which I am loving so much that I was considering to get a back-up. I am lucky though because they are almost the same, this one is just a little cooler. Bottom left (powder): A stunning deep natural khaki with very complex shimmer. Although I am no khaki lover, this one makes my heart sing! Bottom right (cream): Light ivory base with satin finish. Now let's look at this... It gives me the most perfect natural eye look in a minute so I ended up wearing this two times last week. It is beyond gorgeous, more so in real life than in pictures. I never thought I would love a khaki quad that much. I applied the pink/plum shade all over the lid, light pink on the inner corner and khaki on the crease and outer corner. I used cream base underneath. I applied the Suqqu Gel Eyeliner Pencil 02 Dark Brown along the upper lash line and Suqqu Gel Eyeliner Pencil Ex-01 Bordeaux along the lower waterline. Side note: after I was super impressed with Suqqu Gel Eyeliner Pencil Ex-01 Bordeaux, I went ahead and purchased Suqqu Gel Eyeliner Pencil 02 Dark Brown which I am using everyday at the moment. I can't recommend it enough. It stays put all day. One of the looks from last week when I was wearing Suqqu Blend Color Eyeshadow #21 Yoihagi & Gel Eyeliner Pencil 02 Dark Brown on the eyes. On my lips I have Estée Lauder Envy Liquid Lip Potion in True Liar (review is coming up). I am also wearing Dior's new design of Tribale Earrings. I am planning a review of that one as well. 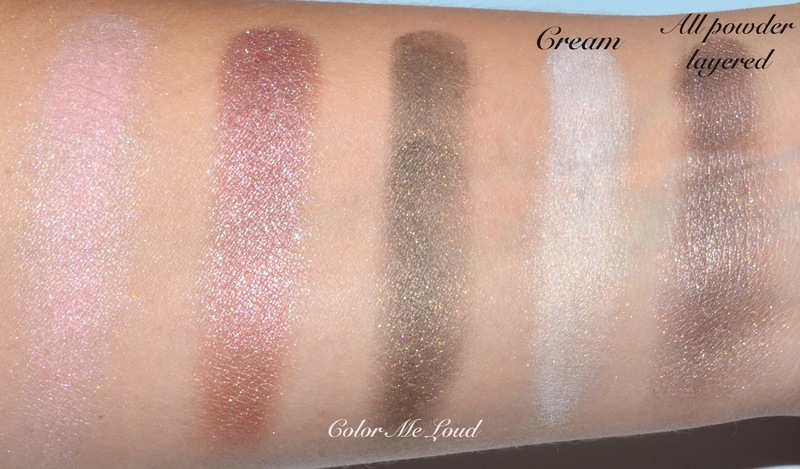 Check out Swatcharama for more swatches. 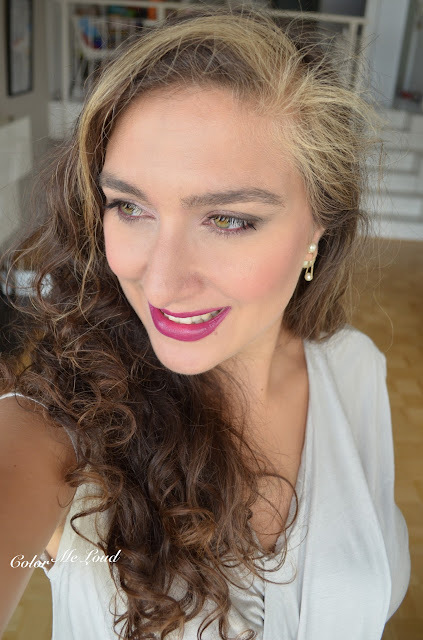 Final thoughts: Big love for Suqqu Blend Color Eyeshadow #21 Yoihagi to give a natural look which is not boring. Especially those who find khakis to be a bit too warm will love this one. Suqqu quality, what else to say. Do you own any gel eye liners? How do you find them? OOO interesting! This quad sure is pretty! I also love True Liar on you. It's perfect isn't it?! I normally just stick to gel liners because they work. This one seems interesting! the four colors layered in the swatch are super super pretty!!!! lovely!! 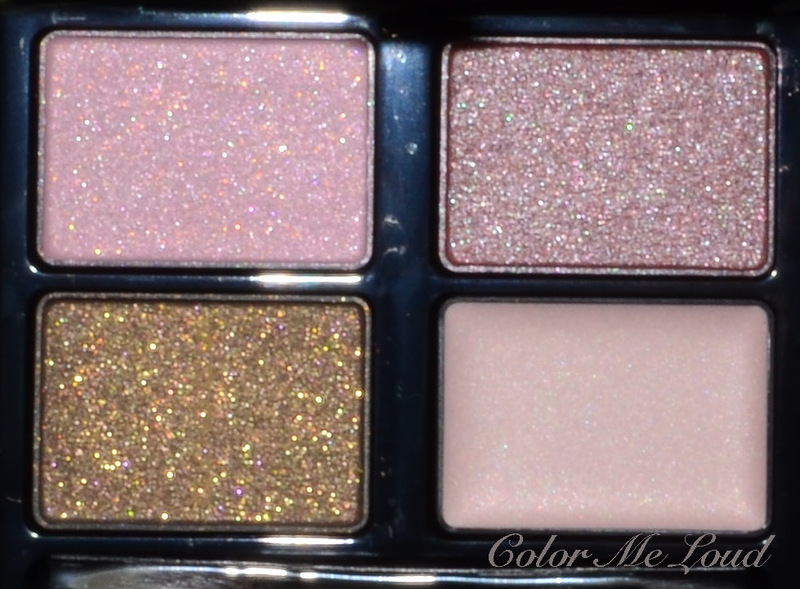 This palette looks beautiful and so pretty! Ugh!! So many pretties! Suqqu never produced that until now, cheap looking chunky glitter I mean lol. Whenever you have the opportunity, you should check them out. LOL yes, there are so many of the pretties. I was almost skipping this because I skip Khakis by default, I am glad I haven't done that. Ich bin mir sicher dass du die andere Palette besser findest, ist etwas kühler, passt dir besser denke ich. Yes that shows the magic of Suqqu, you can layer and create new pretty shades. They always turn out to be lovely taupes. I am not so sure about True Liar. It goes everywhere, like over my teeth, around the mouth. Don't you have that problem too? Don't you look the Greek goddess there with that dress!! And yes, pls review some haute jewelry! hahaha... Now stop giving me unhealthy lemmings! 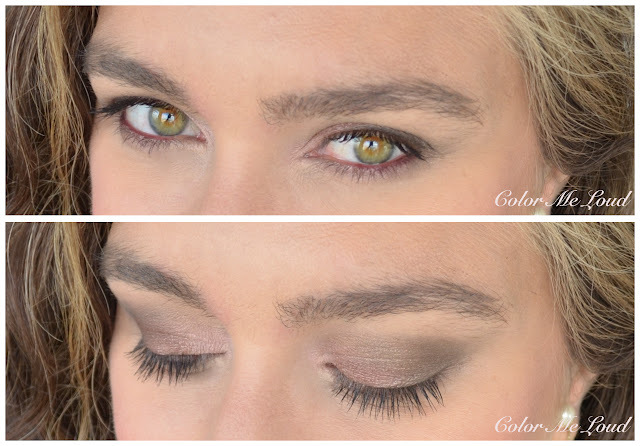 That taupey goodness with SUQQU all layered is killing me! I was thinking the same so I tried to resist this quad but it seems the pink hues make it cool enough. I like the gel liners and use it daily but they are a little hard to take off, especially since I am not using oil around my eyes.